Poison ivy, poison oak and poison sumac plants are becoming larger and stronger, a trend that's been developing over recent years, according to researchers. That may be a combination of the plant's nature to cause more severe reactions over time and the increased carbon dioxide in the atmosphere as a result of global warming. A substance in the plants called urushiol oil is to blame for the notorious itchy rash that develops in people who touch it. 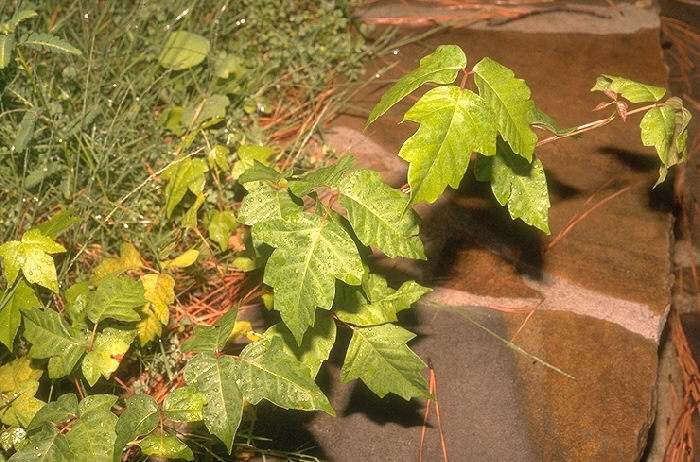 According to the U.S. Forest Service, 70 to 85 percent of people exposed to urushiol oil in poison ivy and its cousins will experience an allergic reaction. Unlike other allergies that people may outgrow, sensitivity to this oil gets worse with each additional exposure. Though urushiol oil starts penetrating the skin immediately, people may not recognize the danger and may continue touching the plant and spreading the oil, since the allergic rash often doesn't appear for 12 to 24 hours. "It's becoming more prevalent. Climate change, warmer temperatures, carbon dioxide rising -- in fact, carbon dioxide levels are expected to double by the end of the century. It tells the plants to grow bigger leaves. And the oil itself, that causes poison ivy rash, is more powerful and supercharged," Dr. Clifford Bassett, an allergist and assistant clinical professor at NYU School of Medicine, told "CBS This Morning"
The first step in prevention is to recognize the poisonous plants, which have distinctive qualities. Many varieties of poison ivy and poison oak have branches with three leaves, hence the popular phrase, "leaves of three, let them be." But the rule isn't foolproof: the leaves sometimes grow in larger clusters. Poison sumac may have clusters of 7 to 13 leaves. The leaves often have black spots which look like paint splatters, caused by blobs of oil that leak out become oxidized in the air and turn black. Poison ivy grows in every one of the lower 48 states except California. According to the Centers for Disease Control and Prevention, the best protection is to avoid contact with the plants; don't try to remove or burn them because the oil can cause lung irritation if inhaled. Outdoor workers should exercise extra care around wooded areas, including learning to identify the plants and wearing protective clothing when near possible growth. There is also a barrier lotion called IvyBlock that contains the only FDA-approved drug to prevent rash from poison ivy, poison oak and poison sumac, known as bentoquatam. The National Institute for Occupational Safety and Health (NIOSH) created this video explaining how poison ivy looks and works. A more rare and dangerous poisonous plant which is also found in the Northeast, called wild parsnip, can cause rashes that leave scarring and blindness if its oil comes in contact with eyes. If the oil from a poison ivy, poison oak, poison sumac or related plants touches the skin, remove the oil as quickly as possible to minimize harm. The U.S. Forest Service recommends cleaning the skin with isopropyl (rubbing) alcohol within 10 minutes. Some experts warn that using soap can can actually lift the urushiol oil and spread it around the skin. Also wash clothes, shoes, gardening tools, even pets -- anything that could have come in contact with the plants or their oils. The oil can remain active on surfaces and cause allergic reactions even years later. Calamine lotion, antihistamine creams and hydrocortisone can help relieve itching if a rash develops. If a large rash spreads over 10 percent or more of the body, see a doctor.